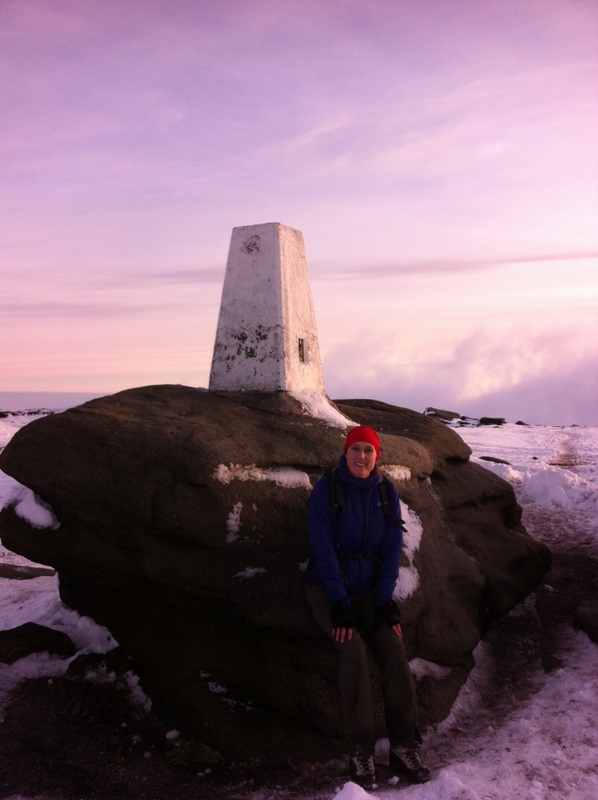 With snow and ice still in command this weekend I gave up on the idea of a 10 mile training run and took the opportunity to visit Kinder Downfall. We started from Edale up Grindsbrook, planning to hike across Kinder, then loop back down the Pennine Way to Jacob’s Ladder back to Edale, a round trip of about 8 miles. 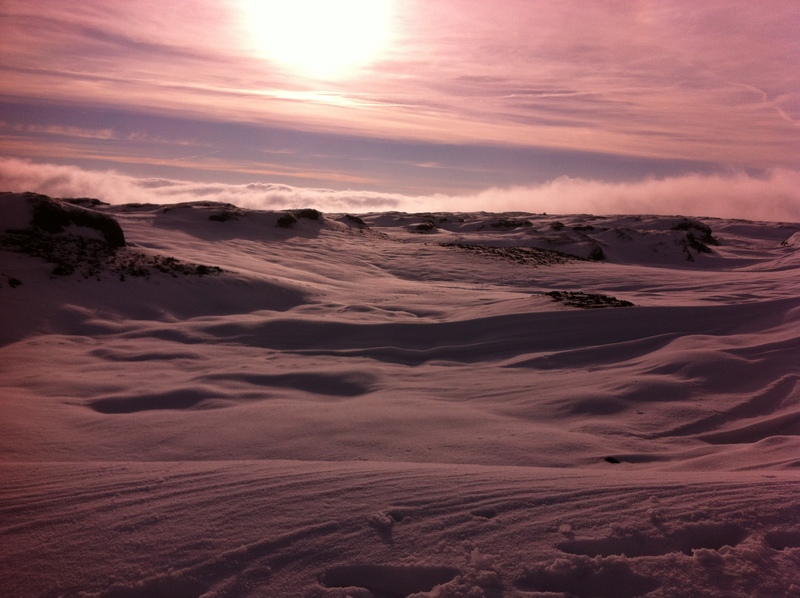 The usual trail was buried in deep snow and we reached the top via an icy gully. Not a problem with good boots, although we were concerned about the tourists in trainers who were picking their way up behind us. …too easy really, and it wasn’t long before we decided to leave the trail and make our way across the totally pristine landscape and aim directly for the Downfall area. What an amazing experience, there were no footprints except rabbits, birds, and then our own. The wind blown snow has a fluid feel, forming in peaks and troughs like waves, and at times the clouds seemed to be below us so that I felt even more that I had washed up somewhere totally separate from reality. After some time surfing and wading in the general direction of the Downfall the view suddenly changed and a rocky outcrop was visible. 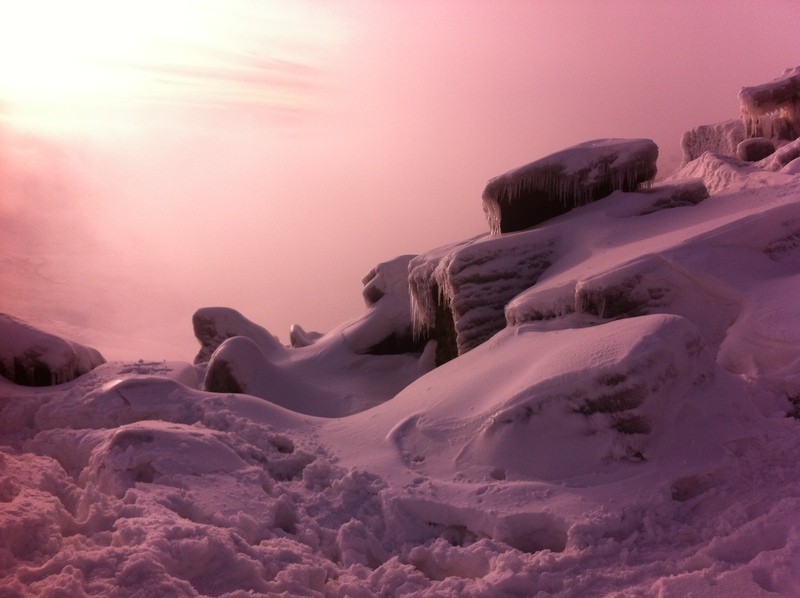 At 30 meters Kinder Downfall is the tallest waterfall in the Peak District, and in winter conditions it becomes a beautiful and precarious pillar of ice. 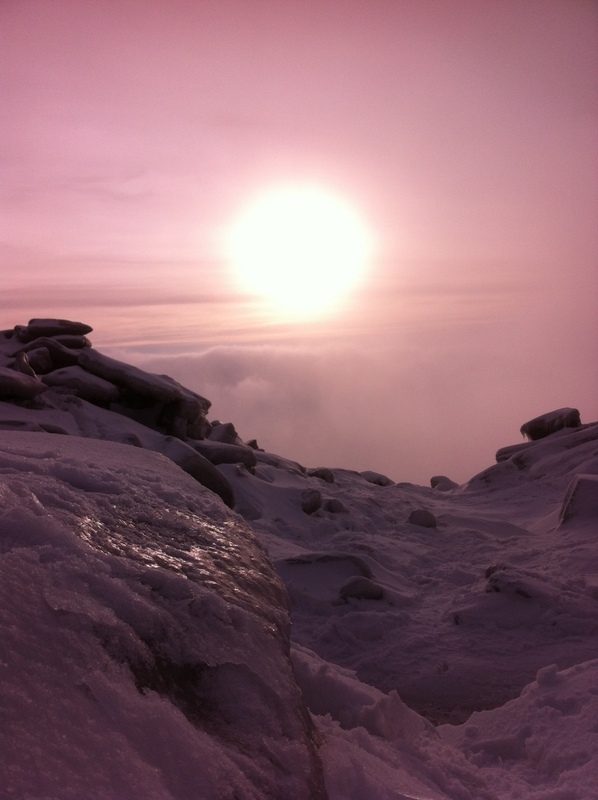 Nearing the top of the Downfall I noticed strange formations of ice coating the gritstone boulders, glittering in the last of the day’s sunlight. 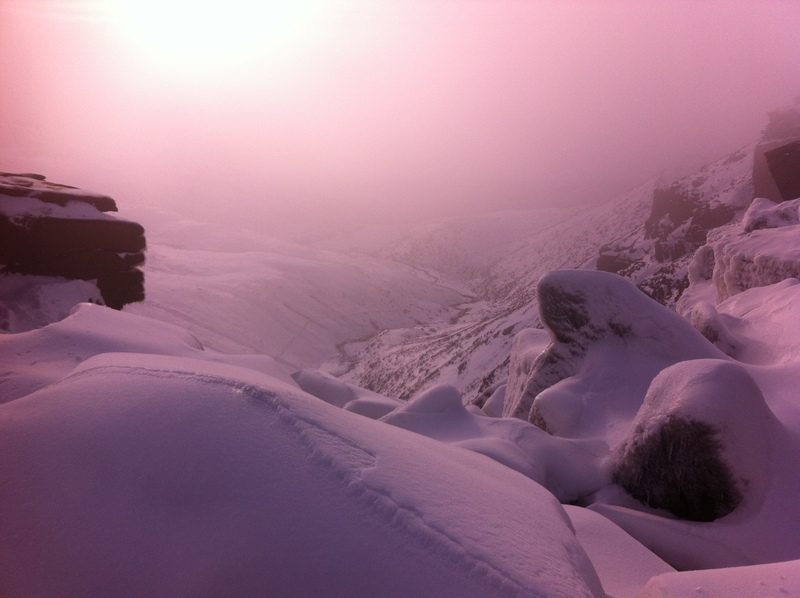 There was nowhere safe to stand, so unfortunately I couldn’t take a photo of the frozen Kinder Downfall. 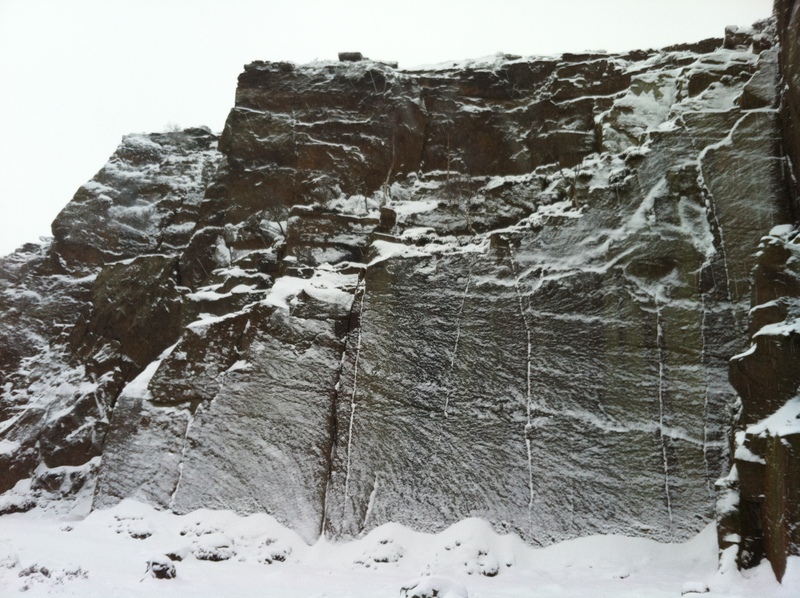 Two climbers were reaching the top and reported that conditions at the the bottom were not good, although it hadn’t deterred them from their ascent. As the clouds parted again the view down to the valley was spectacular. The sun was beginning to go down and after one last look around it was time to leave. This is the first time that I have been to Kinder Downfall and what an incredible time to visit. 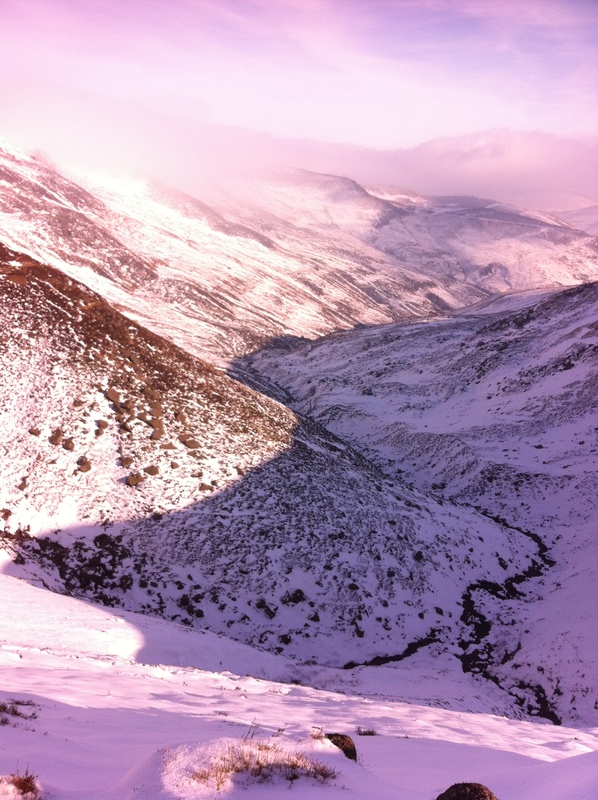 It was an easy walk home from here, whipping down the Pennine Way – actually easier in snow than on a normal day as all the awkward rocky sections became soft snow to wade down. What an amazing day, I can’t wait to come back in the summer to see what it looks like when the water is flowing, the ground isn’t frozen under ice and snow, and the rock is dry enough to climb. 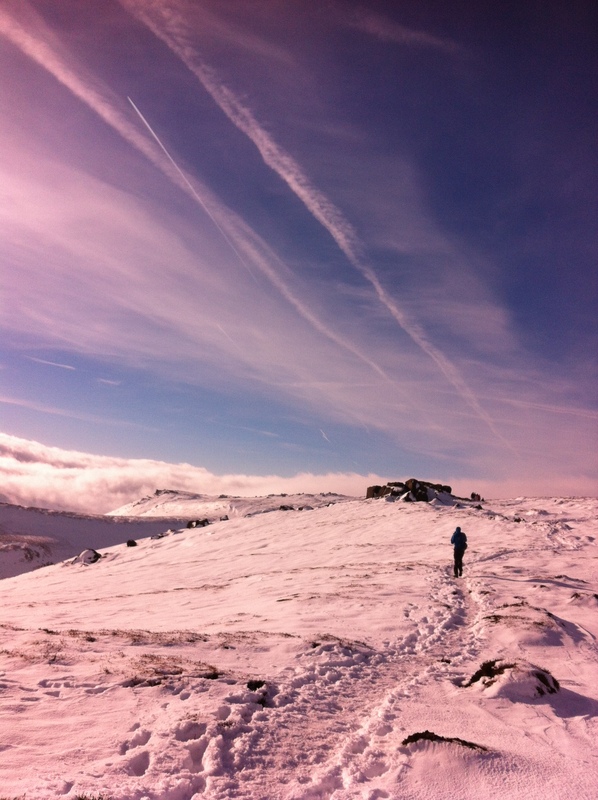 This entry was posted in Hiking and tagged adventure, climbing, Hiking, peak district, photos, snow, Trail running, travel, winter on February 9, 2015 by Anna Paxton. crumbling concrete and rusting iron walkway. It was built more than 100 years ago to allow hydroelectric plant workers access around the gorge, but fell into disrepair and became accessible only to climbers. Having never done via feratta before, and having a sheer drop to the valley floor between my feet from the first move, initially I was scared and backed off the Caminito. Left on my own at the start of the walkway though, I realised I didn’t want to miss out, and I made my way across polished limestone and rusted iron bars to catch up with my partner. 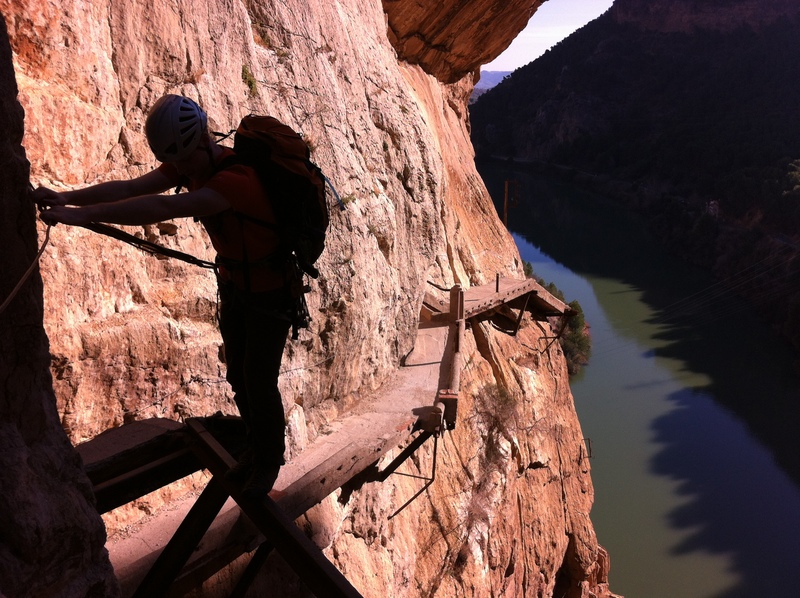 It was a unique and atmospheric experience, never to be repeated as the authorities in Spain have since rebuilt and reopened the walkway as a safe and accessible tourist attraction. 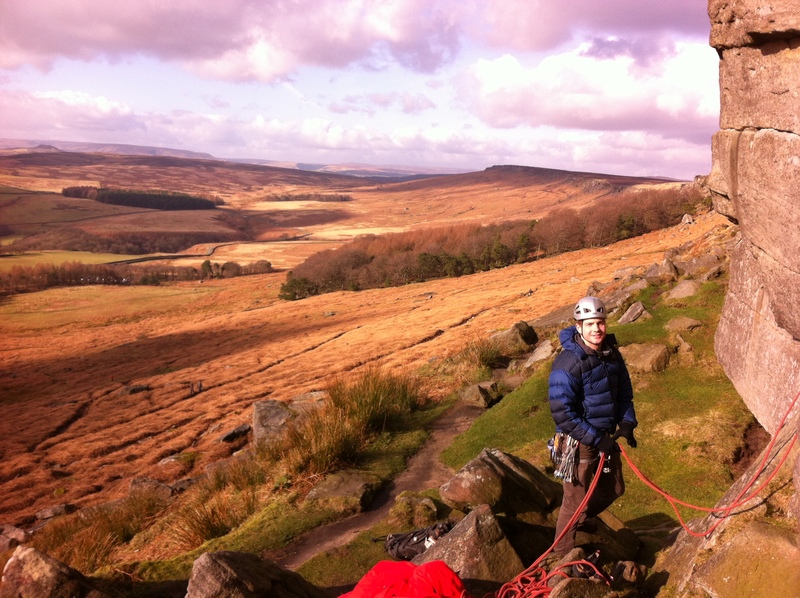 Via Media (VS 4c), Stanage Popular, Peak District – 1 March 2014: This was one of those days that remind me exactly why I climb. In spring sunlight with clear blue skies Stanage looked beautiful. 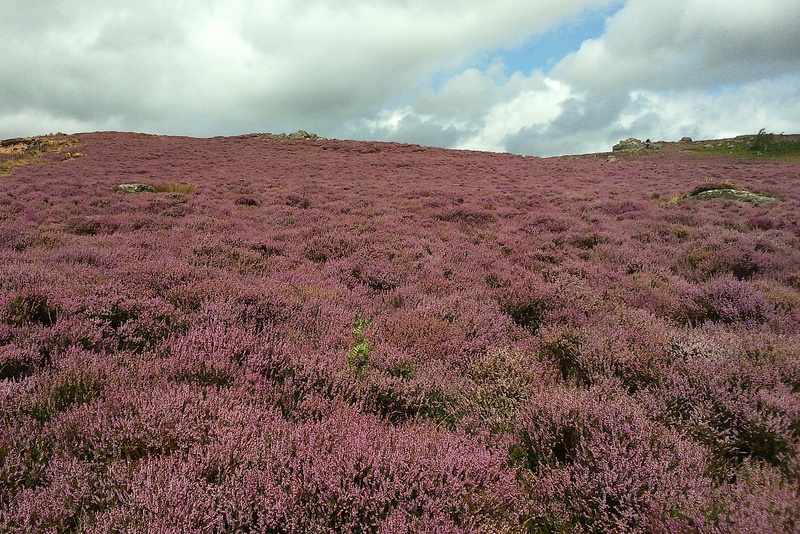 Stanage Popular has an abundance of routes, but I always notice Via Media. It’s a 10m route that starts with a thin straight crack on a flat wall and it went on my wishlist as soon as I saw it, even when I thought the grade was way beyond me. It doesn’t happen often, but on this day almost all my climbing partners were out and at the same crag, creating a happy atmosphere. Clio belayed for me, I always feel particularly proud to climb routes with her as we don’t often see two girls leading routes together. All around me routes were being ticked, and I ticked mine, no drama, just an enjoyable climb at one of my favourite places with some of the best people. happily second every route, but now that I’m learning to lead I feel the need to pull my own weight a little more. 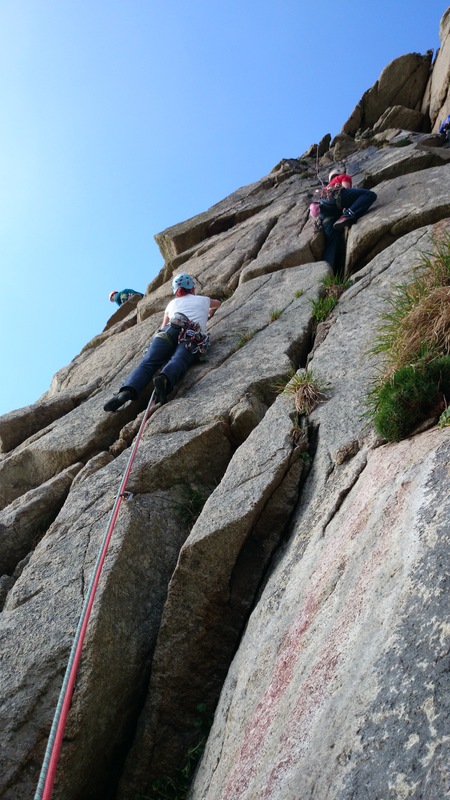 Alt-leading is such a rewarding climbing experience, combining the luxury of seconding pitches in fantastic positions with the challenge of leading. 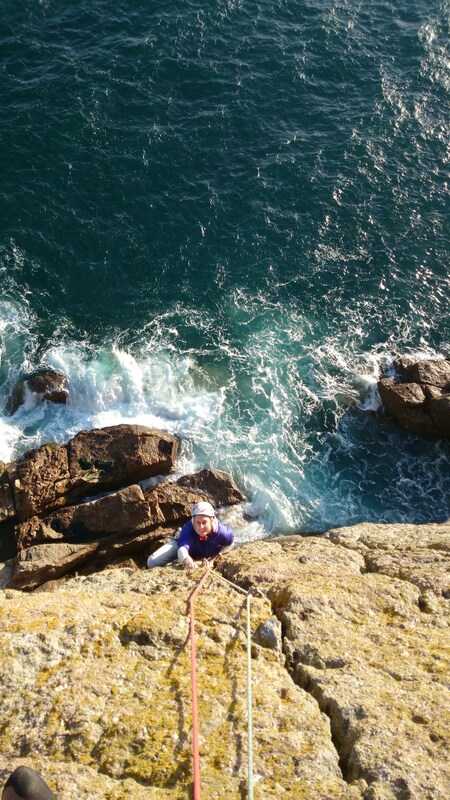 Doorpost is a classic three pitch route at one of the most popular sea cliffs in Cornwall, and Jonny was able to lead an E-grade first pitch to make the route more interesting for him. 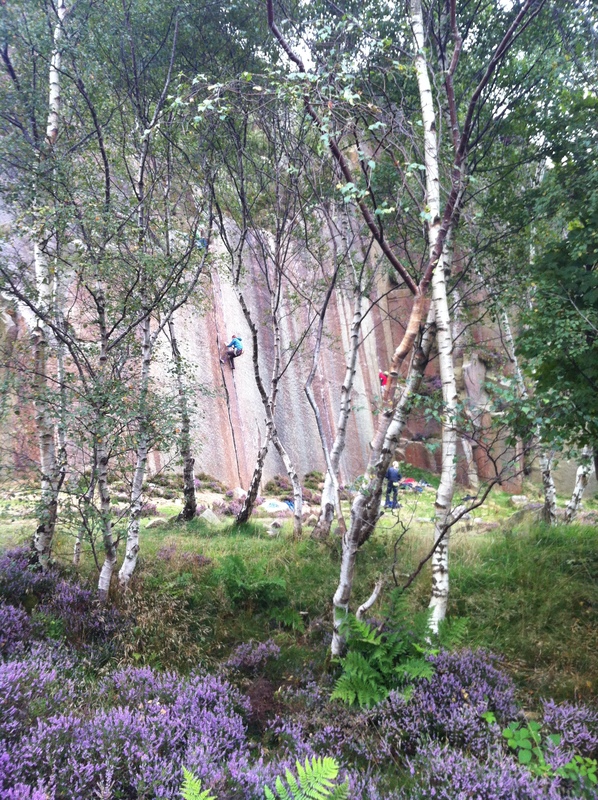 I led the second pitch, technically the crux but really very straight forward, and Jonny led the final pitch. We spent a long long time at the first belay ledge, due to a slightly over-confident third person in the party ahead of us realising that he actually couldn’t second HS in trainers. 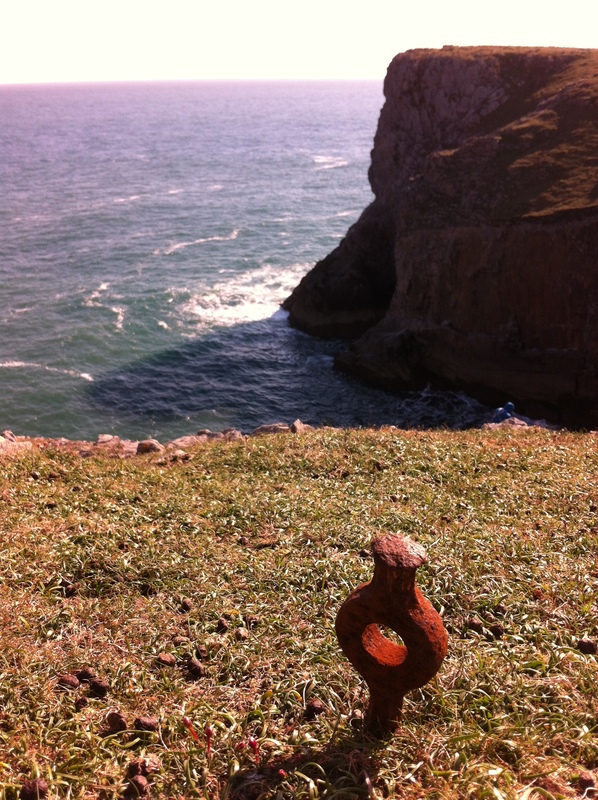 All the more time to look out at the sea, watch for seals, and enjoy the Cornish sun. Slam the Jam (6a), Horseshoe Quarry, Peak District – 15 May 2014: I wouldn’t recommend this route to anyone, the bottom half involves a broken up groove which in Horseshoe Quarry style feels like it could collapse if you stand on the wrong part of it. The bolt that would protect the crux felt a bit too high and resulted in shaky precarious clipping, much slack, and a nervous belayer (Clio). But the finish is no-excuses hand jamming for several moves through a roof and up a rightwards slanting perfect hands crack. This is when I realised that I really had learned to jam! I was so amazed I led it twice, just to check that I didn’t dream it. 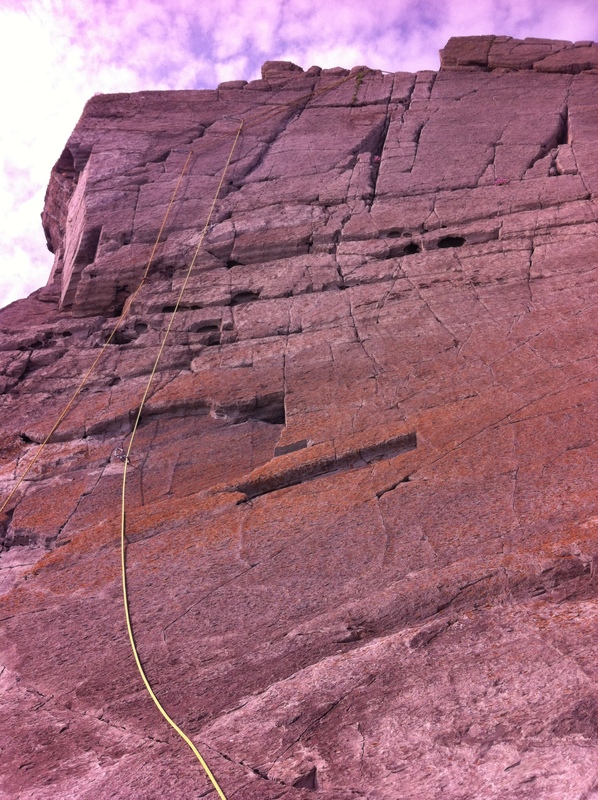 Nutcracker 5.8, Manure Pile Buttress, Yosemite Valley – 15 September 2014: Yosemite granite schools us and schools us again. 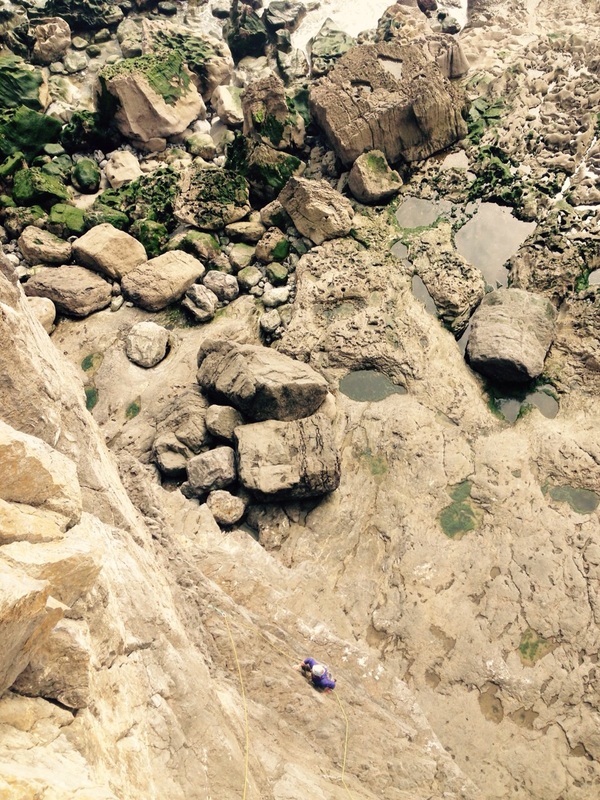 This time the lesson was that one litre of water is not enough for two people on a 150m 5 pitch climb during a heat wave. We had just arrived from autumn in the UK and hadn’t anticipated just how much heat would radiate off the rock. This is one of the most popular routes in Yosemite, so we should have realised when it was deserted that conditions wouldn’t be great! 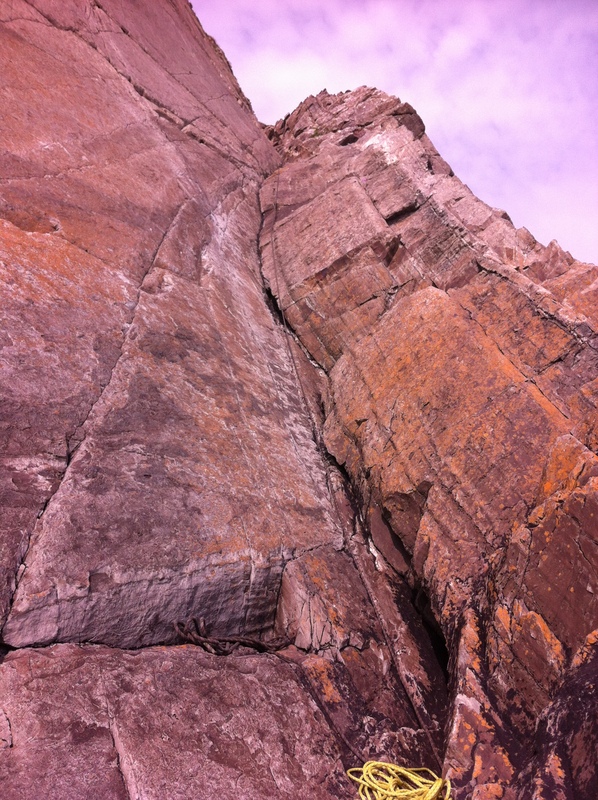 The route follows a series of cracks, the first one being the hardest with a pumpy and slippery layback round a roof. After that the climbing is never too hard, but certainly interesting, including a very intimidating looking mantle up a slightly overhanging corner. Long multipitch is what climbing is all about for me, we don’t get to do it very often in the Peaks where the longest route is around 35m. I didn’t lead any pitches, so thanks to Jonny for this experience. Now… Onwards to 2015 and all it’s adventures, planned and unplanned, bring it on… Happy New Year! 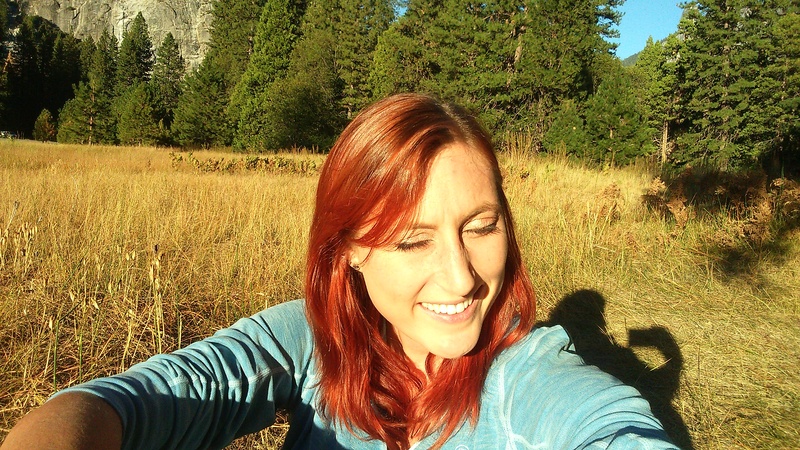 This entry was posted in Climbing and tagged california, climbing, photos, rock climbing, trad climbing, travel, yosemite on December 31, 2014 by Anna Paxton. It’s great to discover new places, but when you visit the same place again and again you get a real appreciation for the changes in the light, weather, and wildlife throughout the year. 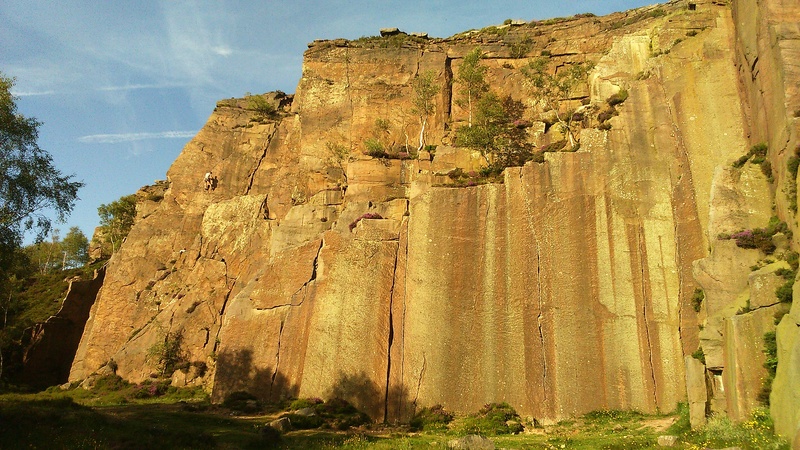 One of my favourite places to climb is Millstone Edge in the Peak District, it’s one of my local crags and the one I have probably spent the most time at. Here is a year in pictures at Embankment Wall, which is just one wall of many at Millstone. As well as having great routes to climb, I think its the best looking and it’s amazing how it can appear so different every time I visit. This picture was taken during the exceptionally snowy winter of 2012/13. You can see the routes where the cracks are frozen and full of ice on an otherwise almost completely blank face. 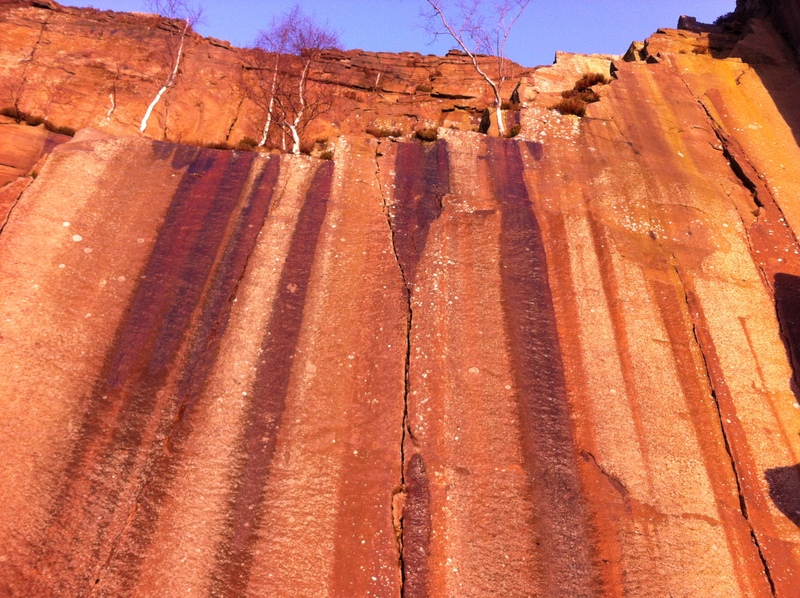 The rock has amazing stripes of colour that can look anything from pale pink to dark red, green, or grey. 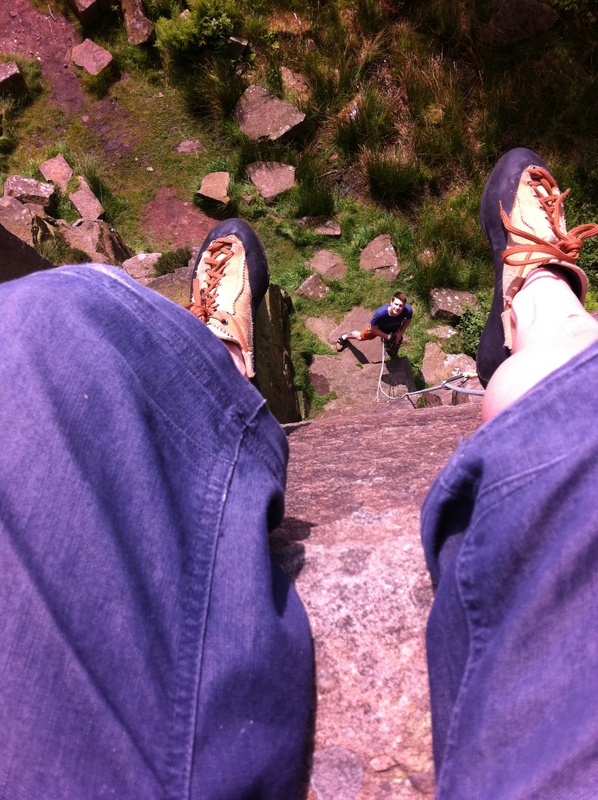 To prove that I actually do sometimes lead routes, here’s a picture I took at the top of Chiming Crack, a lovely but short perfect hands crack (HS 4b). At the end of the day the rock glows in evening sunlight and the colours come alive. You can see me here through the trees, on a day when we were practicing finger cracks by climbing the right hand crack of Embankment 2 (which takes it from VS 4c to E1 5c). 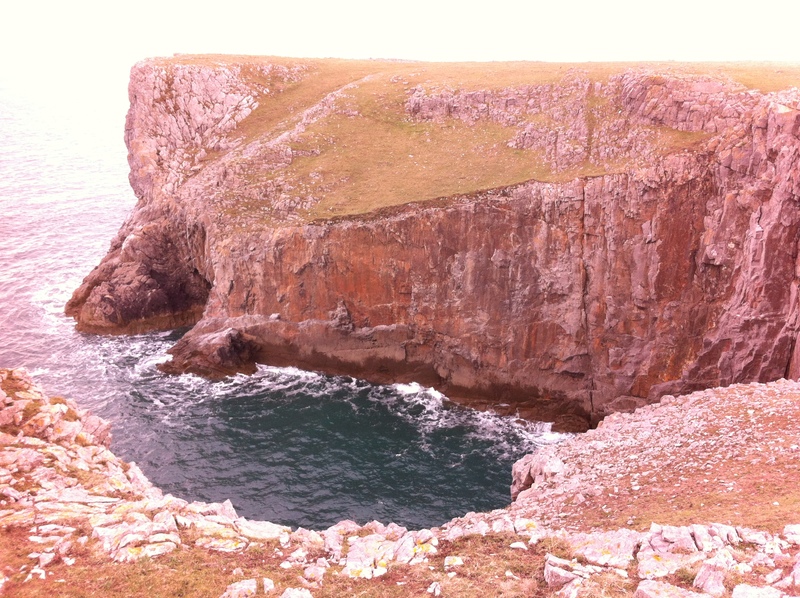 …and as a bonus, the walk in looks like this! 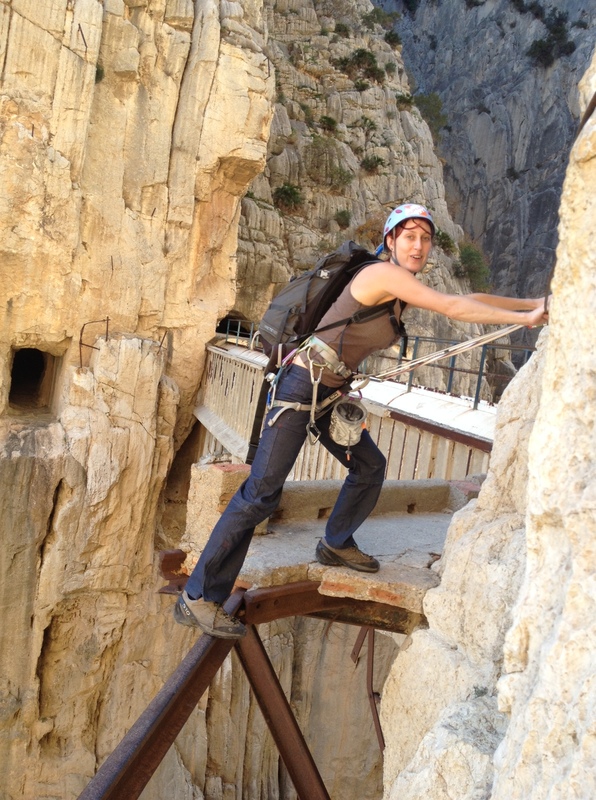 My favourite routes at Millstone are – Covent Garden, Plexity, Eros, and Embankment 3 & 4. I have lead some of them, others I still hope to lead. 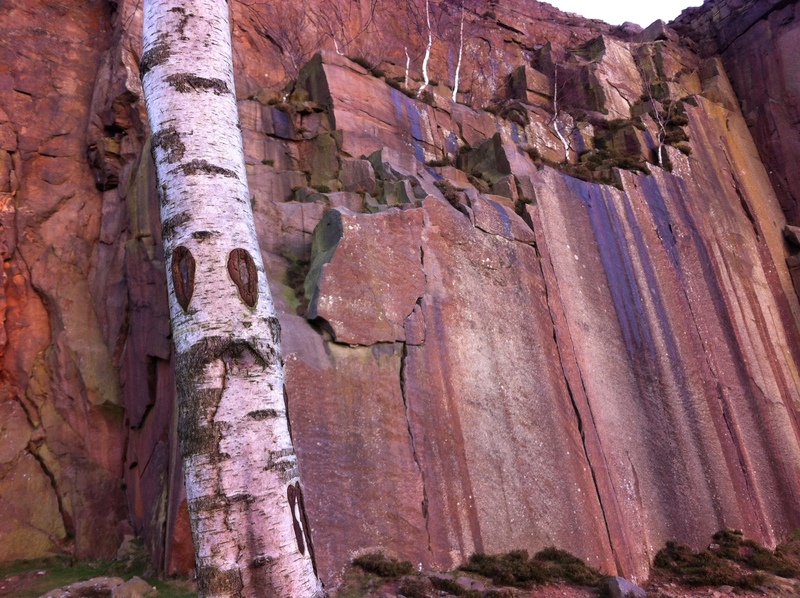 This entry was posted in Climbing and tagged climbing, embankment wall, millstone, millstone edge, outdoors, peak district, photos, rock climbing on November 27, 2014 by Anna Paxton. This weekend the clocks went back and evenings are going to be dark for months to come. 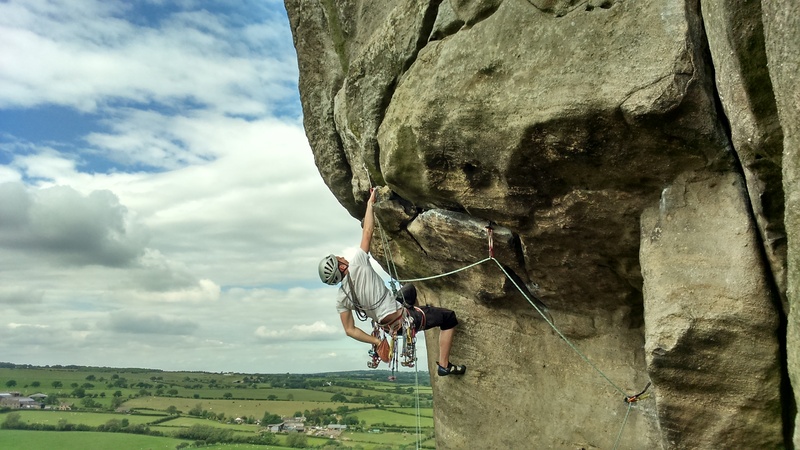 As a reminder of the summer, here’s a photo I took back in June of Sam Fletcher climbing a route called Western Front at Almscliff, North Yorkshire. I uploaded this to my UKC profile, and was surprised and pleased that it was voted second in the UKC top 10 photo of the week. 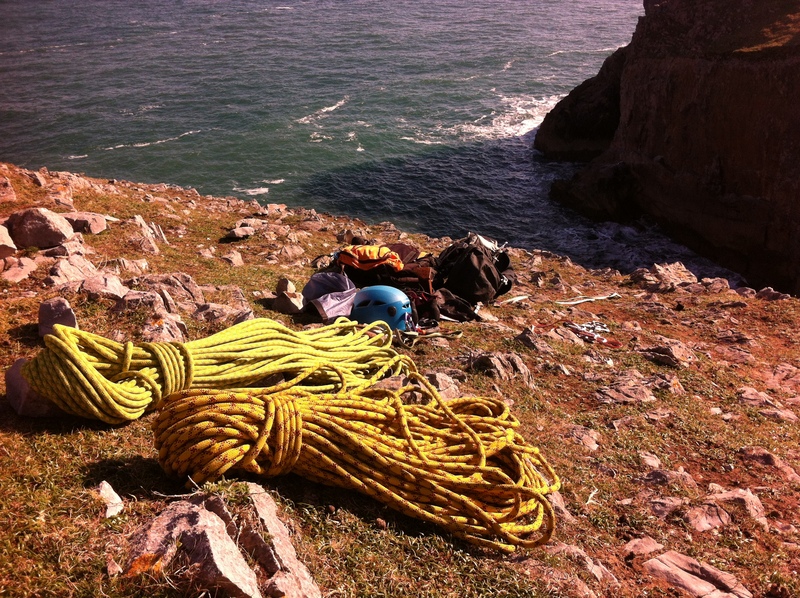 You can view my photo gallery here http://www.ukclimbing.com/photos/author.html?id=161736.